Most people who've been playing violin for very long have had the experience of opening a case that hasn't been opened for some time and finding much of the bow's hair hanging loose. Some may attribute it to "just brittle old hair", but it's actually caused by bow bugs, aka carpet beetles. Bow bugs are little insects that chew through your violin bow hair and leave little dried larval shells behind. Eventually, every bowed instrument player will have some experience with "bow bugs". If you're unlucky, you'll open your violin case one day and find several bow hairs hanging loose. More commonly, it's a bow that's been stored inside a case unopened for months or years. For years I've known the signs of bow bugs: broken or chopped hair, tiny insect shells in the lining of the case. Everyone just called them bow bugs without knowing what the actual name was, or what the living insect looked like, or its life cycle. Finally, I collected some shells from a customer's case and sent them to the Oregon Department of Agriculture's Insect Pest Prevention and Management office, where Jim LaBonte identified them as "carpet beetles" and told me some things about how they live and how to control them. 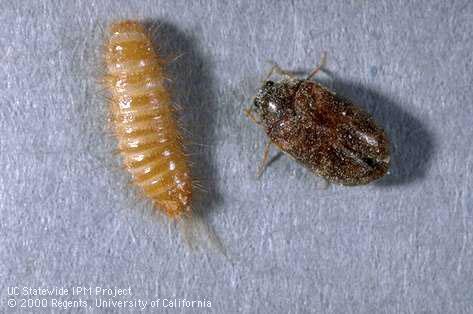 A varied carpet beetle larva and adult. Shows the larva of an Anthrenus verbasci (varied carpet) beetle frass, cast skin, & a single grain of blue rodent bait damaged by the larva. One of the first things he said was ”I would venture that these are in every house, every building.” Yet, the living larva or beetle are rarely seen. The adult beetle is a small, reddish-brown to black beetle about the size of a ladybug, 1/10th to 3/16th of an inch long. The adult beetle only lives from two to six weeks. It can fly, but like a ladybug, not very well, so it doesn't travel great distances by flying. It feeds on pollen and nectar and is attracted to light. Before it dies, it lays eggs on a food source. 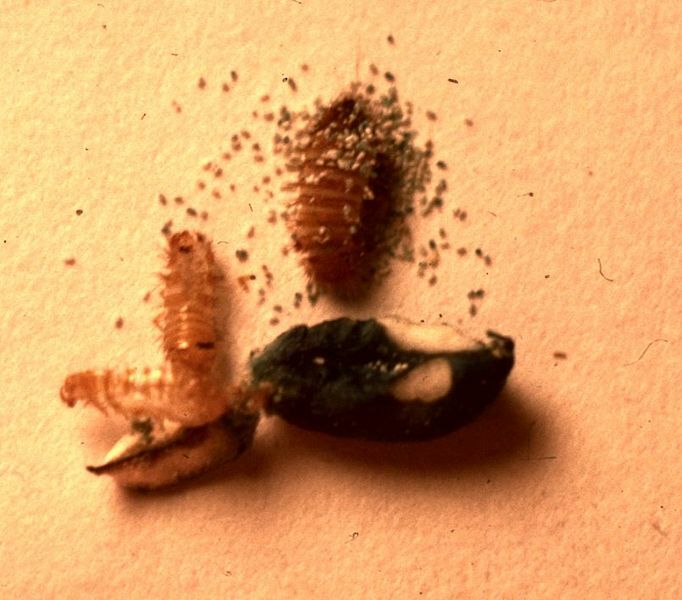 The larvae hatch in about 2 weeks and begin eating. Larvae cannot fly, but they crawl very well to reach food. Larvae prefer dark, undisturbed locations like closed violin cases. Larvae live for a couple of months to over a year and a half. It is the larvae that do the damage to bow hair. They will also eat real whalebone bow winding, wool, silk, leather, fur, and other natural materials. Moths are often blamed for damage done by carpet beetles.